↑ "चीन ने अपने डिफेंस बजट में की 12.2 फीसदी की बढ़ोतरी". नवभारत टाईम्स. 5 मार्च 2014. अभिगमन तिथि 5 मार्च 2014. 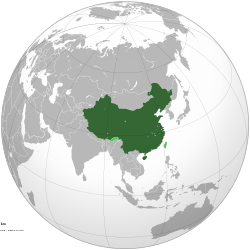 ↑ "China's gross domestic product (GDP) growth". Chinability. अभिगमन १६ अक्टूबर २००८. ↑ "China’s GDP: Still Number Three - China Real Time Report". Wall Street Journal. २ जुलाई २०१०. अभिगमन १६ अगस्त २०१०. ↑ Taking the Deliberative in China Stein, Justin J (Spring 2003).